When I started at Loughborough University working on the Medal Makers programme I knew I was starting something special and momentous but little did I know exactly what was in store! Walking around campus with the rest of the team and seeing all the first class sporting facilities really brought it home to me exactly where I was working. Loughborough University, to me, is synonymous with sport and I couldn’t think of a better place to work! The first couple of months flew by in a flurry of policy and strategy writing and the start of the recruitment phase. The Preparation Camp was due to open on 18th June and we needed our volunteers in place to start on that date! The first task for us to undertake was to organise some volunteers to take part in the dress rehearsal of the Olympic Torch Relay! 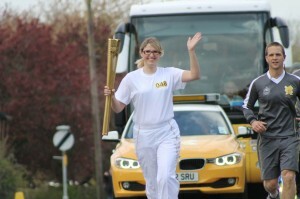 I was lucky enough to be nominated also and had the chance to run with the official Olympic Torch. By May we had recruited most of the volunteers and we held the first of five briefing/training sessions, neatly timed for the start of the Olympic Torch Relay, carried for the first time by Ben Ainslie (one of my sporting greats).With tears in my eyes I welcomed the first batch of volunteers and thanked them for coming. Once the volunteers were briefed and we only had 4 weeks to do our final preparations it was all hands on deck to get people into roles and locations ready for day one…..and somehow we managed it! Day one of Preparation Camp brought its own challenges with more volunteers needed for certain roles and less for others. It was a juggling act all the way through with the need for volunteers changing on a regular basis but all roles were filled and no job was left undone. The 3rd July was another great day as that was the day that the official Olympic Torch Relay came through campus, again! This time I was able to enjoy the spectacle as the torch passed by and I saw the torch ‘kiss’ outside the Sir Denis Rooke Building. The Relay was preceded by a fun and colourful carnival marking the relay as it passed through the East Midlands. That week proved to be pretty special as not only did we have the Olympic Torch, but I was lucky enough to meet Princess Anne, Sir Steve Redgrave and to be present at David Cameron’s address regarding legacy. The Opening Ceremony of the London 2012 Olympic Games marked another key event for the Medal Makers with a party and the opening of the Beckwith Clubhouse. The Medal Makers and I had worked really hard to turn a lecture theatre into an inviting clubhouse for people to kick back, relax and watch the Games. The clubhouse proved to be a massive success with a full house on many an occasion. Staff and volunteers watched and cheered for Team GB as they won most of their 65 medals. On the 6th August Preparation Camp finished. The Team GB branding was all taken down and their presence here on campus became a memory….or did it? Work had already started to commemorate the Olympics in the form of a participatory arts project outside the Sports Development Centre building to serve as a permanent reminder of the impact that the Olympics has had on Loughborough University and its staff, students and volunteers. I know that my Olympic odyssey was truly over when we held the final thank you and farewell party for the Medal Makers on 15th August. With genuine tears of joy and sadness I made my goodbyes to my new friends and vowed to meet them all again on our next volunteering adventure. I have truly loved my time here at Loughborough. Through the many highs and lows that I have worked through I have learnt that I am resilient and tough and can face adversity face on. I am cheerful and diligent and work with tenacity to achieve great things. I will miss the people that I have met along the way and thank each and everyone of them. This entry was posted in British Olympic Association, Daily routine, End of camp, Events, Inspirations, Kitting Out, Lboro community, Lboro staff, Lboro students, Legacy, Preparation Camp, Team GB, Torch relay, Uncategorized, Volunteering/life balance by Alex Barker. Bookmark the permalink.